It's getting real, y'all. As I type this, I'm on a flight to Ohio, kicking off the first leg of this year's grand tour. 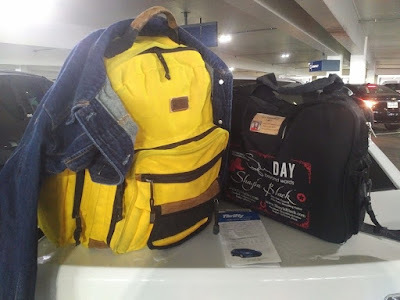 Can we do three and a half weeks with nothing but a yellow backpack, a red hat, and a blue jean jacket? There's only one way to find out. Not a celebrity author rock-star. Just a black-belt carry-on badass. So here's what's on the itinerary - please let me know if I'm hitting close enough to your neck of the woods for a hang-out hoedown! presenting "The Seven Deadly First-Page Sins"
After that, there'll be a couple more days of Phillyandering before I fly home on the 21st. And seriously, y'all. Do hit me up if you want to do something. I like playing these away games, but they are notoriously short on familiar faces - and yours would be more than welcome. Okay? Okay. And for those of you on the home-front: please be good to my dude and my cat while I'm gone. They take good care of each other, but there's more to life than shotgunning beer, kibble, and Cops.